﻿ How to Play MKV on PS3/Xbox 360/iPad/iPhone/Android/QuickTime/Zune...? Home » video » How to Play MKV on PS3/Xbox 360/iPad/iPhone/Android/QuickTime/Zune...? How to Play MKV on PS3/Xbox 360/iPad/iPhone/Android/QuickTime/Zune...? Step by step guide on how to play MKV, HD MKV files on PS3/Xbox 360/iPad/iPhone/Samsung/Android/QuickTime/Zune/PowerPoint/BlackBerry/Nokia and more. As an open standard free container format, MKV (Matroska Multimedia Container) can hold an unlimited number of video, audio, picture or subtitle tracks in one file. It is intended to serve as a universal format for storing common multimedia content, like movies or TV shows. However, this file format is not compatible with most media players and portable devices. 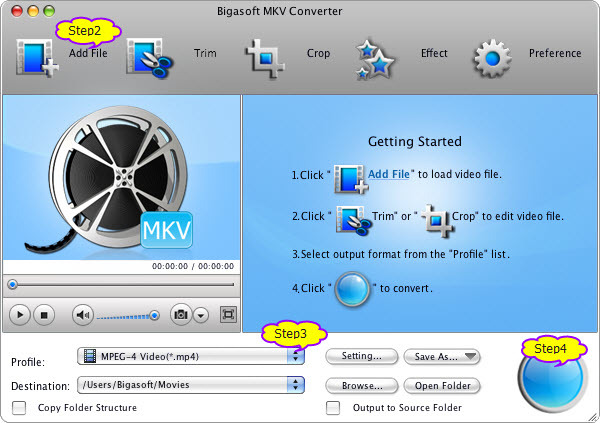 Bigasoft MKV Converter for Mac or for Windows provides an all-in-one solution to solve all the symptoms in playing and editing MKV video files. 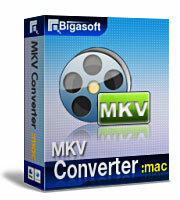 Free download Bigasoft MKV Converter (Windows Version, Mac Version), install and Run it. Click "Add File" button to import MKV video file. Or you can also simply drag your MKV file directly to the main interface of this software. Click the drop-down button on the right side of "Profile" to select proper output video format for specific player or portable device. To play MKV on iPad, iPhone, iPod, Apple TV, PS3, PSP, Zune, Android, Samsung, BlackBerry, YouTube, Facebook and more, select MP4 from the "General Video" category from the "Profile" drop-down list. To play HD MKV, select proper video format from "HD Video" category, and then select desired video resolution by clicking "Setting..." button. Press "Convert" button to start the MKV conversion. After finishing MKV conversion, locate the converted MKV files and transfer them to your media players or portable devices to achieve playing MKV movies anywhere including MKV iPhone, MKV Zune, MKV iMovie, MKV PowerPoint, MKV PS3, MKV iPad, MKV Xbox 360, MKV Samsung, MKV Android, MKV QuickTime, MKV BlackBerry, and MKV Nokia etc.